The Gooding and Company Amelia Island 2016 auction was held Friday, March 11 at the Omni Amelia Island Plantation Resort in Florida, resulting in $60,162,150 in total sales and an 87 percent sell-through rate. Gooding’s 7th annual Amelia sale held during the Amelia Island Concours d’Elegance weekend featured almost 80 cars. With an average price of $871,915 per car sold, highlights included the $22,244,500 garnered by the Jerry Seinfeld Collection and the 1961 Ferrari 250 GT SWB California Spider that set the single lot record for a car sold in the history of all Amelia Island auctions, as well as for a Gooding & Company auction overall. The tent was overflowing before the Jerry Seinfeld Collection offerings crossed the block. The crowd was treated to Jerry Seinfeld joining David Gooding on stage to introduce his collector cars to his fellow enthusiasts and potential bidders. Among early Porsche on offer, Seinfeld’s 1955 Porsche 550 Spyder spawned a lengthy bidding battle until the final offer sold the car for $5,335,000. Other results from Seinfeld’s Porsche collection included the 1959 Porsche 718 RSK that sold for $2,860,000; the 1974 Porsche 911 Carrera 3.0 IROC RSR that sold for a strong $2,310,000; the 1990 Porsche 962C that sold for $1,650,000; the 1958 Porsche 356 A 1500 GS/GT Carrera Speedster that sold for $1,540,000; the 1994 Porsche 964 Turbo 3.6 S Flachbau that sold for $1,017,500; the 1998 Porsche 993 3.8 Cup RSR that sold for $935,000 and the 1963 Porsche 356 B 2000 GS/GT Carrera 2 Coupe that sold for $825,000. Lastly, auctioneer Charlie Ross worked the room for Seinfeld’s 1960 Volkswagen Beetle until the final price was reached at $121,000, a world auction record for Volkswagen Beetle. 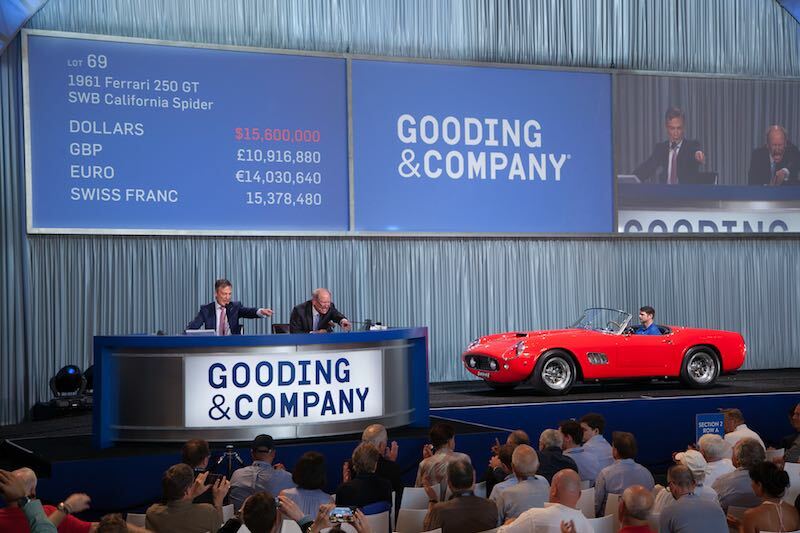 The top result at Gooding’s 2016 Amelia Island Concours auction went to the 1961 Ferrari 250 GT SWB California Spider that sold for $17,160,000, the single lot record for a car sold in the history of all Amelia Island auctions, as well as for a Gooding & Company auction overall. Other notable Ferraris included the 1995 Ferrari F50 that sold for $2,310,000 and the 1960 Ferrari 250 GT Series II Cabriolet that sold for $1,512,500. Other offerings included the 1931 Duesenberg Model J Disappearing-Top Convertible Coupe crossed the block with a final price of $2,640,000 and the 1966 Ford GT40 Mk I that made $3,300,000. Gooding & Company’s next sale, the Pebble Beach Auctions, will take place on August 20-21, 2016, at the Pebble Beach Equestrian Center. The 2015 Gooding & Company sale saw a total of 115 cars fetch a combined $128 million in overall sales. For more information, visit Goodingco.com.